Google+ added a small YouTube icon that's always displayed next to the scrollbar. When you mouse over the icon, you'll see a search box that asks you "what would you like to play?". Type your query and Google+ opens a pop-up window with 20 search results. It's actually a playlist and videos start playing automatically. You can +1 a video you like or share it with your circles. 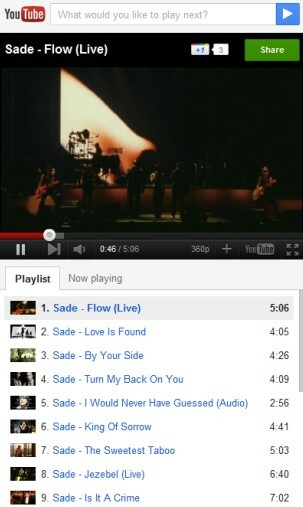 When you share a video, Google also adds a link to a playlist with related videos. The nice thing is that you can minimize the pop-up window and still be able to pause a video or go to the next video directly from Google+. This is especially useful for music. What about a Google Music player? YouTube allows them to get around that limitation. User wastes more bandwidth as they are not streaming music but entire videos. And it is sad that you cannot shut down the popup window. Would be a lot better if we can also play our own Youtube playlist. Picking random things to play is not what I had in mind in terms of playing music. I'd rather visit the Youtube site instead of searching for things to play using this small widget. I agree with the end of this article, it's high time for Google to harness the power of Google Music Beta. It would be great to share my extensive music collection with others right there in the interface. There are so many possibilities as far as music goes. I'm looking forward to coming changes! "What about a Google Music player?" In Germany half of YouTube is blocked by GEMA. This will improve the user experience in addition to promoting user experience..
Where did this go (after redesign) which IS brilliant by the way. Will it come back? agree were did it went? right where did this go. pleas answer tell ask. This was the best thing ever. I need it back.